An assortment of screw covers for hex-head screws from The Hillman Group. Screw covers are used to conceal round, pan, truss, and other flat-bottomed screw head types. Parts in this assortment come in white, cream, black, tan, and aluminum silver-colored variants. 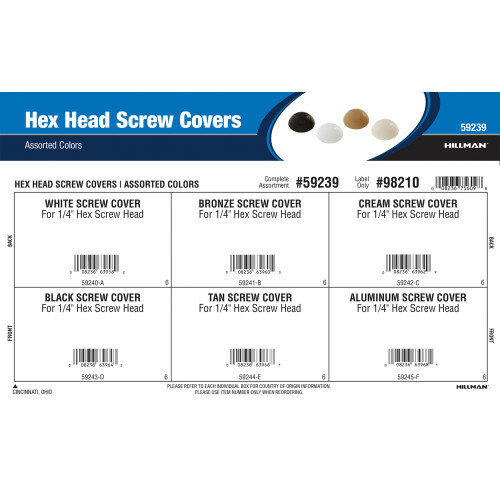 Included screw covers are sized to fit 1/4" diameter hex screws. Full assortment contains five (5) refills comprised of Hillman item numbers #59240 and #59242 - #59245.